…working for peace, social justice, and the environment since 1980. Peace Week 2018 – A Peace Economy for all San Diego NOW! It is tax season again…and what are we paying for? If the President stays true to his word, another $500 billion in war funding. The US already spends more than the next 9 top-military-spending countries. Consider filling out a Peace Tax Return this year. Download your Peace Tax Return form here. 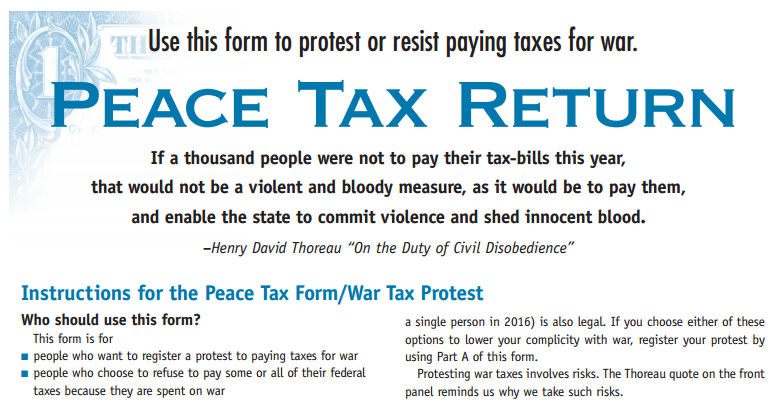 And visit our friends at the National War Tax Resistance Coordinating Committee at nwtrcc.org to learn how you can redirect your war taxes back to your community. Anne Barron is the San Diego War Tax Counselor if you have questions about war tax redirection. Contact her at anne@prcsd.org. City Heights – Your Voice is important! Feb 9 & 23 community planning with PPMT. RSVP now for this proven skills training by Meta Peace Team. Meet the 2019 Board of Directors! Fall 2018 News & Souper Supper!